As my beloved little boat Elinor with her small size, outboard engine and wooden mast wasn’t quite up for this journey, I searched around for a very strong boat that would also sail well. I soon came to the conclusion that the highly respected boats drawn by Arvid Laurin would be a good option for my trip. Caprice is a Laurin Koster – a L32 built in Karlskrona Varvet in 1969. She became mine this spring. The previous owner Peter had done a lot of work to prepare her for a long distance trip. She had new sails, a new engine and a new Aries Windpilot that had not yet been fitted. 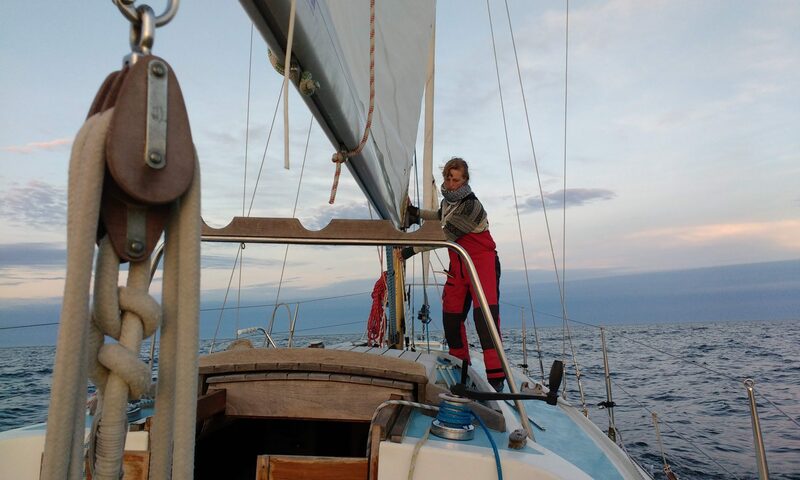 I sailed her from Vaxholm in Stockholm around the south tip of Sweden and to Gothenburg in May and she showed me how softly she handles big sea and how steady she feels to sail. During the summer I have replaced the standing rigging, put steps in the mast, fitted the Aries, replaced bearings in the rudder, had a sprayhood fitted, improved the interior, fitted new winches, fitted new batteries in a box and rewiring of electrics with the help of my dear father (an electric engineer :), fitted more solar panels, AIS, inverter….. and so on. She has even got a beautiful new tiller made by Leif Andersson på Bergalunds snickeri.